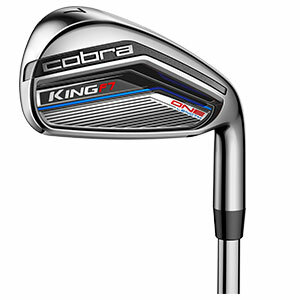 The Cobra Golf KING Forged and KING Forged ONE LENGTH irons are the ultimate player’s irons, with Tour-proven performance and optimised for soft feel, distance and precision. The KING FORGED ONE LENGTHTM utilises a 5-step forging process that ensures precise iron shaping and more refined grain structure, along with unparalleled feel for better players. The set is comprised of constant length irons that have been re-engineered for 7-iron weighting and are designed with optimised geometries to provide consistent trajectory and distance gapping from long irons to wedges. In addition, the KING FORGED ONE features 100% CNC Milled Face and Grooves for maximum spin and trajectory control, Tungsten Weighting (in 4i-7i) for a lower and centered CG and a Thermoplastic Polyurethane (TPU) Insert (4i–8i) behind the hitting zone to damp vibrations for better feel and moves weight toward the perimeter for added heel and toe relief. Rounding out the COBRA Golf 2017 iron family are the new KING FORGED TOUR irons that offer Tour-proven performance, feel and precise shot-making. The KING FORGED TOUR irons utilise the same premium technologies as the KING FORGED ONE, but with a traditional set length and head weight progression. The KING FORGED TOUR, which also use a 5-step forging process, are designed with Tungsten Weighting employing high-density tungsten weights that are strategically positioned on the sole of the clubhead for a lowered and centered CG that delivers the ideal blend of forgiveness and precision. A TPU Insert located behind the hitting zone damps vibrations and improves feel while CNC milled faces and grooves improve the structure and maximize spin and trajectory control.